My love for baking Chiffon Cake is always inspired by passionate chiffon cake bakers such as Small Small Baker, my bestie @ahpoohbear and a few others. Their love for chiffon cakes could be shown through their recipe posts or photos of the chiffon cakes that they baked. And as you realise from some of my post I love citrus fruits such as Lemon and Orange which I often incorporate it into my bakes or dishes. Since there was a special offer on oranges last week which I bought for making fresh orange juice, I decided to bake an Orange Chiffon Cake to pair with it for afternoon tea and at the same time make use of those lovely orange rinds which enhance the taste and aroma of the cake. This is my first time adding a little glare for my chiffon cake and I decided to drizzle it with some Orange Icing which is made of icing sugar, orange juice and Cointreau. 1. Whisk egg yolks and 25g caster sugar for 2 minutes till slightly pale in colour, stir in oil and freshly squeeze orange in sequence until everything is well combined. 2. Next slowly whisk in the sieved flour into the egg mixture till no trace of flour is found. Stir in the orange rind and set the mixture aside. 3. Preheat the oven to 180°C (degree Celsius). 4. Beat egg whites and 1/2 of the remaining 45g caster sugar with an electric mixer until mixture becomes frothy and foamy. 6. 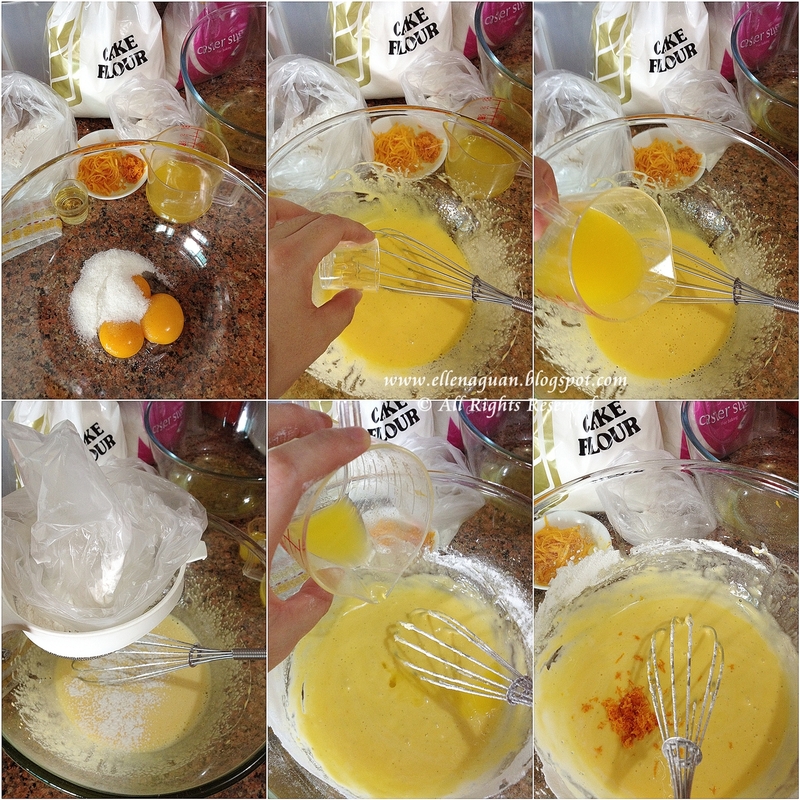 Using a balloon whisk carefully whisk in the stiff egg white into the egg yolk batter in 3 separate additions, with the 1st addition to incorporate the whites into the yolk mixture till combined leaving no trace of whites. 7. Next add in the 2nd and 3rd addition of whites using the balloon whisk in a gentle manner in order not to knock off the air in the whites, just fold till no trace of whites and the mixture are well combined. 8. Lastly lift up the bowl to height, pour the mixture into the tube pan and tap the pan once or twice on a table top to get rid of any trapped air bubbles in the batter. 10. Remove it from the oven and invert the pan immediately to let it rest on top of a cup. Make sure it cool completely before unmould. 11. To remove the cake from the pan, run a thin-bladed knife (i use a small plastic spatula) around the inside of the pan and the center core. 12. Release the cake and run the knife/spatula along the base of the pan to remove the cake. Cut into serving size and serve with a glass of freshly squeeze orange juice for extra flavour. 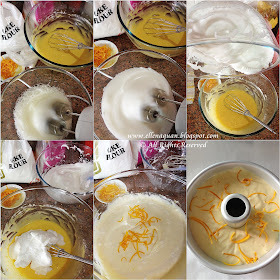 This Orange Chiffon Cake has a wonderful orange fragrance which is light and spongy in texture. You could make this ahead in the morning and serve with some whipped cream or seasonal fruit fresh to impress your guest too. 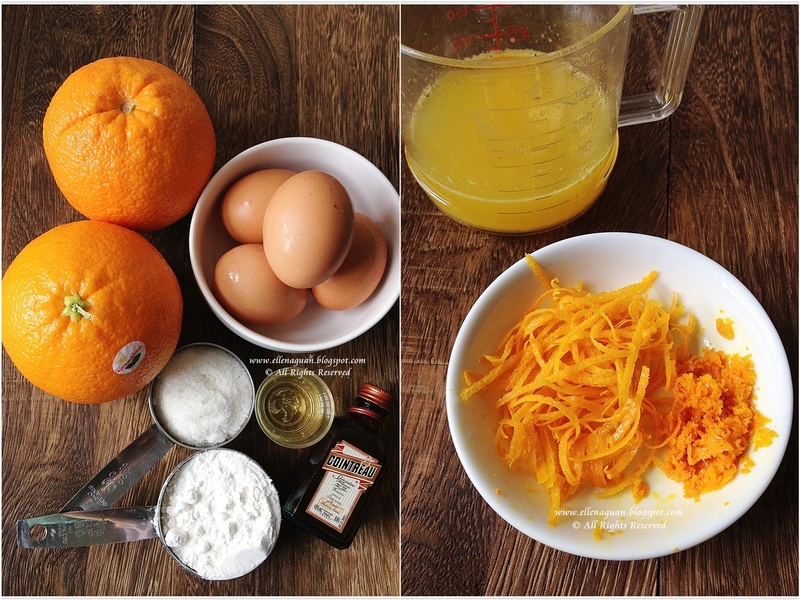 While removing the orange rind, remember to wash the oranges thoroughly and use a grater to zest out the rind (read more HERE on how to zest the orange rind). 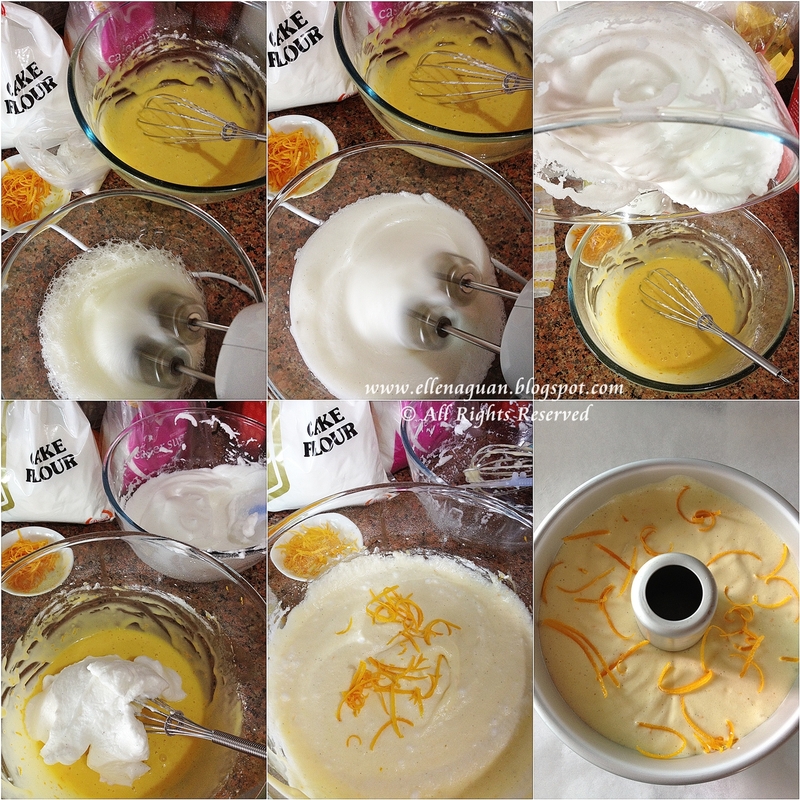 I love love love orange chiffon cake! I made one for my own birthday a couple of years ago. :) Your's look much more intense with the orange icing and extra zests. Can't wait to try your recipe. Yup we love this too! Love the texture and taste especially with freshly squeeze orange juice and zest! Hi SSB, I have more to learn from your chiffon cake posts! Love all your creations! Lovely chiffon! The orange flavour is refreshing. You are a true chiffon cake mistress (is that a female version of master?? sorry i forgot)! I need to come back to all of your chiffon cake recipes when I'm ready to make it one day (and need to buy mold too). BEAUTIFUL!!! Could you please tell me which shop you bought your chiffon tin from, if it was in Singapore? Or did you buy it online? Thanks a bunch. any tips for adapting this recipe to a 23cm chiffon tin? May I know what is Top flour or Cake flour?